Do you ever feel as though someone is pulling your leg regarding a certain issue, and all you want is the truth? Well, unfortunately, not knowing and being in the dark about answers to something can be frustrating, no matter what the topic is. 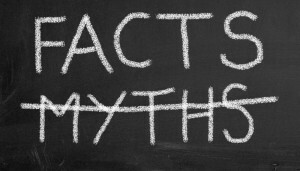 Although many may not know this, but there are a lot of common dental myths that people are misinformed about. Let us clear some of those misconceptions up, that way you can be rightfully informed concerning you and your smile. One common dental myth is that bleaching your teeth makes them weaker. When you want to whiten your smile, you should not have to worry about the structure of your teeth, and luckily, this myth is false. Whitening agents only affect the color of your teeth, not their health or their strength. Granted, the side effects to bleaching your teeth may include sensitivity and irritated gums, but the internal structure of your smile has not been compromised. Another dental myth is that brushing your teeth is a bad idea if your gums are bleeding. Sure, it seems like a good idea not to brush your teeth if your gums are bleeding, but it is actually the opposite of what you would want to do. When your gums are bleeding, it means that plaque and other things, like food particles, are irritating them, and they need to be removed to stop the bleeding. Your gums may also bleed if your floss too violently, so be sure to take excellent care of them as to prevent the bleeding from starting. There are many other dental myths that need straightening out, so be sure to keep yourself as well informed as possible. That way, you are not only able to take better care of your smile, but your body as well! Comments Off on Dental Myths Uncovered!